Nicknamed the "Spicy Sisters," the nine adoptees from China and their adoptive parents make an effort to reunite annually. Nine 11-year-old girls pose for a photo, grinning from ear-to-ear. In other photos, they are embracing one another; sometimes, they're wearing matching outfits. “They’re like my sisters, and we can really relate to each other,” Charlotte Emanoff, one of the girls, said. “I love them so much." All nine girls were adopted by different American families in 2007 from the same orphanage in Chenzhou, Hunan, a southern province in China. But despite living in different cities across the U.S., their friendship has endured. They even call themselves the “Spicy Sisters” because of their birthplace — the nickname pays tribute to the spicy cuisine serviced in Chenzhou. Since they were infants, the girls and their families have reunited annually. Missouri resident Debora Bell, one of the parents of one of the Spicy Sisters, explained that she and her husband viewed adopting from China as an opportunity. “We knew that because of the cultural values in China, there were so many girls in need of homes,” Bell said. According to recent data from the U.S. State Department, the number of male versus female adoptees from China has evened out, compared to a decade ago when the vast majority of adoptees from China were female (84.8 percent in 2007). The Bells and eight other families adopted through the Great Wall Adoption Agency in Austin, Texas. They all turned in their paperwork and received their referrals — photographs and biographical information of their daughters — at the same time. The agency organized a mandatory two-week trip to China for the families to pick up their daughters, and the parents were introduced via email. As they traveled through China together, Bell said the group of nine families began to feel like one. “We talked a lot about the fact that these girls had spent their first year together. Even though they were babies, they were family,” she said. Their connection, though already unique, may become even rarer as international adoptions from China have declined over the past decade. The first reunion happened a year after returning to the States between the Emanoffs, who are located in Minnetonka, Minnesota, and the Franquis of San Diego, California. They decided the entire group should meet up, and the next year, the girls and their new families had their first reunion. Ed Franqui said they didn’t plan for the reunions to be annual at first. But after the success of the first gathering, the group hoped to take trips together every year. Since then, the families have reunited all over the country, from San Diego to St. Louis to Pigeon Forge, Tennessee. Though most years not every family can make the trip, they try to choose places close to one of the family’s home. 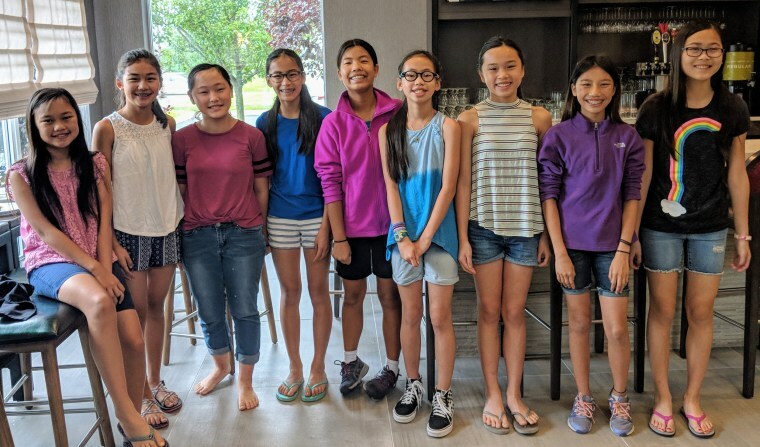 In 2017, six of the nine families returned to Chenzhou, China, for a heritage trip — a trip Maggie Richards, one of the girls, said was her favorite "Spicy Sisters" adventure. "It's our home, too," Richards said. “We wanted to keep those bonds," Emily Richards said. "These girls really are her sisters, and we wanted to keep those ties strong."